Rate the Wire Management Above You! Re: Rate the Wire Management Above You! Modded the ide cable myself, although you can't see it from that angle the majority of cables are in the dead zone and out of the airflow of the fans. Salty I love your electrical tape mod. why is there no sli bridge on those cards, saltynay? Mobo came open box so no accesories previously had a crossfire mobo so have no bridge to stick on it. Was going to buy one but a bit pointless as I am tearing them apart now. Drivers let me do through board sli bridge loses about 50% of the potential speed increase though I believe. ratings anyone? ^ i give you 5/10. 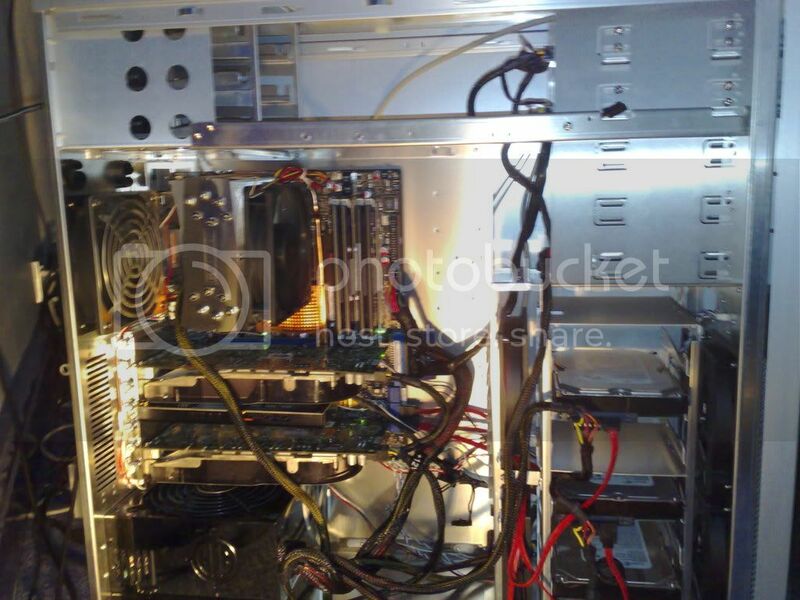 fix that cpu power, route it under the video card. also use some tie wraps and bundle those cables up in front of your hdd bays. oh wow salty, yours needs a lot of work too. 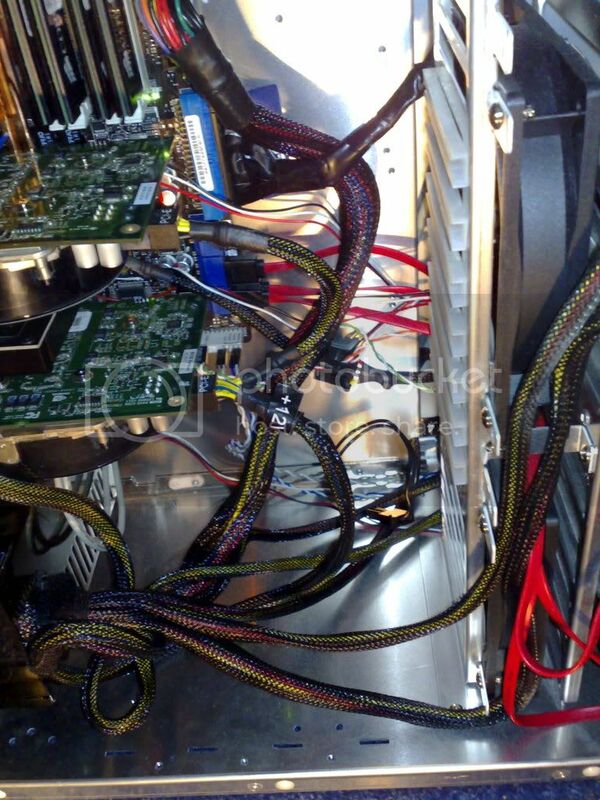 You could start off by buying a cable sleeving kit and sleeving all those bare wires, and you can run that 8 pin cpu power under the graphics cards. Also turn your drives around, run the psu cables through the bottom and out the back and zip tie them. Who needs cable sleeving kit when I have some insulation tape no window so doesn't really matter. cpu 8 pin I am planning to run under the mobo, tried routing it under the graphics card before but can't plug it in as the angle is impossible with the heatsink in. Why would turning the drives round improve airflow? 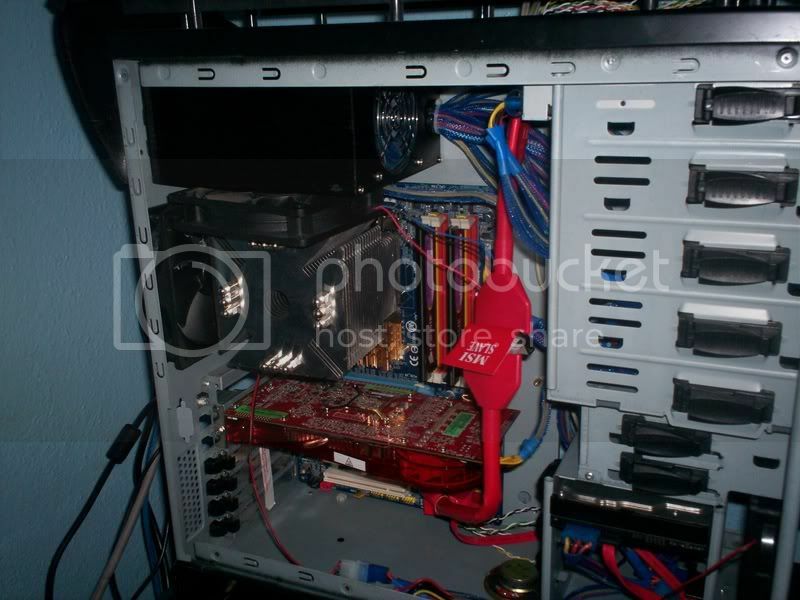 The wires don't disrupt it as they are they are routed between the internal fans. I will put the effort in when I get my card back apparently it could take upto a month from after the shop sending it in, thats a month and a half after I bought the card I recieve it worse case scenario . Also I may get a refurb and not a new one I am going to send some disgruntled letters and emails on monday. Would of saved my cash and waited for the slow price drop that the month would bring + earnt £20 interest on the money as my card has a 105 interest rate which would of got me a gtx 280. Because turning the drives around allows you to hide all those cables. And wire sleeving kits are cheap, $10 last time i checked. And yes please at least tie the cables together.